Hey folks, Jack here. Long time no Round Table, but we’ve been busy on wrapping the Campaign Builder’s Guide and preparing for the push to finish Lairs, our next book after that for Fantasy AGE. Now originally I had intended to do the third Iconic character from our “core three” heroes featured on our covers and such. And I will do that. However, a discussion with Vigilance Press head James Dawsey about his FAGE campaign got me thinking about a particularly utilitarian entry utilizing the Fantasy AGE Companion and Fantasy AGE Bestiary. 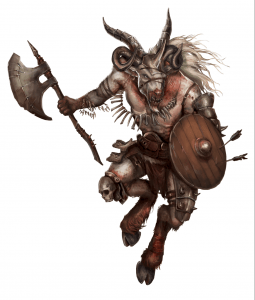 In particular I wanted to discuss Minion rules and how they work with various creatures, but the decisions and analysis here are similar to the thought processes for other parts of the Play Options chapter of the Companion, such as the mob rules. The Companion has Minion rules for disposing of some creatures as a minor threat. This is represented by a Minion Rating, which is the amount of stunt points (SPs) you can use to automatically defeat an adversary. You can even use this to dispose of multiple minions if you have the points, making it possible for skilled heroes to slaughter lesser foes. 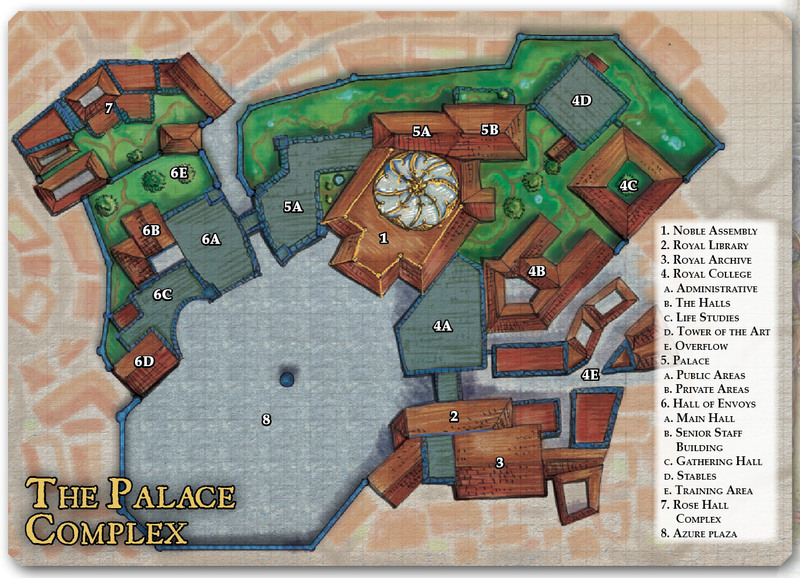 The rules are discussed in more detail in the Companion, but that’s how they basically work. Now the idea behind those rules is that GMs would assign a Minion Rating based on their needs. For example, goblins might be rated 1 or 2, based on how little a threat they are in a campaign. A high-powered game might give Minion Ratings to giants or other powerful foes, while they are never given those in lower-powered games. However, its also true there are certainly general niches and impressions many Minion type adversaries fall into in most campaigns while other adversaries might use these rules in very particular and unusual—but still valid—ways. With that said, let’s look at some Fantasy AGE Bestiary creatures and look at how they interact with Minion rules. I hope this is helpful to those seeking to use these rules in their campaigns. These adversaries all fill the “dangerous in large groups, makes great minions for boss monsters” category. That makes them good candidates for Minion Rating 2. They can be disposed of with some strong attacks, but with some luck you can take down some extras along the way. In high powered campaigns? Drop these down to 1 and watch them fall. Or perhaps make them Mobs and then give the Mobs a Minion Rating—you heard it here first—for games of heroes who can cut down armies like a Fantasy AGE version of the Dynasty Warriors video game franchise. So Chimera don’t usually have Minion Ratings. They’re singular threats and tough. However, you could give their various heads a Minion Rating and then link some of their special qualities to these heads. Hit a “Minion” on the Chimera and they lose their dragon head and its breath or some other part. Other multi-limbed or headed adversaries could be similarly handled. These heads would likely be hard to hit, akin to a Lethal Blow stunt (5 SPs). Thus it would make sense to have these heads be Minion Rating 5. A bit tougher than the above Bouda and company, they usually have Minion Rating 3, meaning a truly epic Stunt can take out two, but they’re still a threat. Gargoyle Minion Ratings should be set at around 4. This would be the equivalent of using a Mighty Blow and Pierce Armor to bash through their stone-hard skin with a disabling blow. Sometimes the adversary suggests a stunt or combination of them which would “finish them”. This makes a good model for a Minion Rating. In these cases, GMs will to do a bit more bookkeeping might offer a discount to a character who has one of the stunts that go into such calculations, making it easier for them to cut down certain Minions. However, this is another thing to keep track of, so its not for everyone. Its worth noting these adversaries are more dangerous in water. Mostly this is because they are at home in this environment where most characters suffer penalties. However, if you’re making aquatic minions? Consider making them with two Minion Ratings, one for out of water and one for in. In this case of these foes? 2 out of the water and 3 in the water makes sense, though you could remove the rating entirely underwater if you want to reinforce how important it is to face these foes on your own terms to ensure success. Reapers generally shouldn’t have Minion Ratings. But what if their ability to mark others for death allowed them to give someone else a Minion Rating? Thus a character marked by a Reaper could be cut down by the creature more easily. This would also be a way to simulate a “death curse”. However, be extremely careful using this concept on PCs and if you do make sure they are taken to 0 health and in danger of death by this, allowing them some way to survive. Vampire Thralls might be Minions, representing how they are sometimes disposed of easily in fiction even as the Vampire Lord is a major threat. This is somewhat represented already with its Hard to Kill special quality, requiring a Lethal Blow stunt to stake or behead them once they have reached 0 Health. However, making these creatures Minions makes them more fragile, doing away with the requirement to reduce their health. In this case, a Minion Rating of 5 is appropriate, the same SPs you’d need to use a Lethal Blow to finish them in their non-Minion state. That’s just a few examples, but it shows the variety of ways the Play Options rules from the Fantasy AGE Companion can intersect with other books in the line. //greenronin.com/wp-content/uploads/2017/07/RoninBanner-1.png 0 0 Jack Norris //greenronin.com/wp-content/uploads/2017/07/RoninBanner-1.png Jack Norris2018-09-04 09:22:462018-09-04 09:22:46Ronin Round Table: Minions! 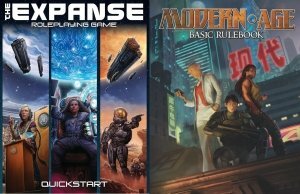 Ronin Roundtable: Expanse Kickstarter Flip ‘n’ Burn! So, here’s hoping the Expanse RPG Kickstarter burns just as hard at the end as it did in the beginning, because we have lot of momentum to shed before it all comes to an end at 9:00 pm Eastern Time on Wednesday, August 22nd. At the $30 Drop Ship reward level, you’re getting PDFs of the Expanse RPG core rulebook, the Game Master’s Kit Screen, GM’s Kit Adventure, Reference Cards, Pregenerated Characters, and the six-part Abzu’s Bounty adventure series. 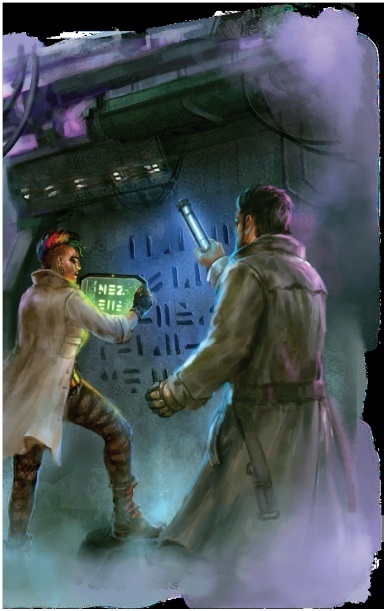 With the starter adventure now included in the core book, that’s eight adventures for your Expanse game (nine, if you count the free adventure included in the Quickstart). At the $70 Destroyer level, you’re getting the Expanse RPG core book and Expanse Game Master’s Kit in print: A 224-page, full color hardcover book, lavishly illustrated with a fold-out map of the Solar System, plus the hardcover stock GM screen, reference cards, and adventure and pregenerated character booklet. Plus you get all of the PDFs, including the six-part Abzu’s Bounty adventure series. 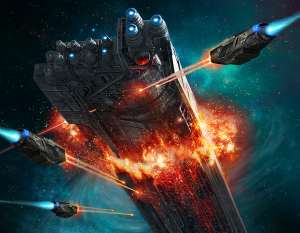 At the $100 Battleship level, you get the special edition of The Expanse RPG core book, with beautiful black leatherette cover with silver solar system graphics and dust jacket, in addition to the printed GM’s Kit and all of the PDF content. We’ve also unlocked an exciting new pledge level: At $1000, James S.A. Corey will write flash fiction about your Expanse character! Based on the info you send, Daniel and Ty will write a one page (200-300 word) “flash-fiction” piece about your character. These will be shared as a PDF with all backers who pledge $30 or more. In addition to the story, you get copies of the Special Edition and the Standard Edition of The Expanse RPG corebook, a bookplate signed by James S.A. Corey, the Expanse GM’s Kit, and all of the PDF rewards as well! That’s what you can get (and there are other backer levels to mix-and-match, including levels for retailers), but you wonder “Tell me more about the game…?” Glad you asked! First and foremost, you can check out the Expanse RPG Quickstart for free: a 40-page PDF that includes essential rules, pregenerated characters, and an adventure you can play right away to give you a taste of the new game. You can also get the Expanse Quickstart in print while supplies last. Fortune: More about how Fortune works in The Expanse in terms of modifying die rolls and how characters recover it over time. Interludes: The Expanse system for handling events that happen in-between the moment-by-moment encounters, providing a framework for long travel times, downtime, and other narrative elements. Qualities & Flaws: Ways to modify technology and equipment in The Expanse to give it individual character and flavor with a minimum of complexity. Space Combat! A look at how combat occurs between ships in space in The Expanse RPG, using a familiar encounter from the novels themselves. Lastly, you can take a look at some of the media coverage The Expanse RPG has received. We’re incredibly appreciative of all of the excitement shown by fans of the series towards the forthcoming game! It has certainly been a wild ride and we’re looking forward to passing the finish line and opening up the universe of The Expanse for countless new stories and adventures that you help to create! https://greenronin.com/wp-content/uploads/2018/08/spacefight.png 789 1018 Steve Kenson //greenronin.com/wp-content/uploads/2017/07/RoninBanner-1.png Steve Kenson2018-08-20 08:34:552018-08-20 10:50:18Ronin Roundtable: Expanse Kickstarter Flip ‘n’ Burn! I’ve been back from Gen Con for nearly a week, having carried back some great memories—and annoying microorganisms. I got “con crud” in whatever form managed to hit my throat, chest and sinuses, while mixing in a fever. I’m running hot right now. And yet, through the haze of my illness, I remember many, many questions related to our recently-released Modern AGE, and its still-in-Kickstarter cousin, The Expanse Roleplaying Game. The Expanse features some elements originally devised for Modern AGE but is its own game. To sort out the details—and remind you that Modern AGE is out, and we’d love you to crowdfund The Expanse! —read on. First off, many people wondered if you needed Modern AGE to run The Expanse. You do not. The Expanse Roleplaying Game is a complete game based on the AGE (Adventure Game Engine) system. However, both games are compatible to various degrees. Modern AGE has a different selection of stunts which can easily be ported over, and has extraordinary powers such as psychic disciplines, which you might want to use in some personal variant of The Expanse. If your primary interest is Modern AGE, new rules for equipment and space travel are among some of the elements you can convert, along with Fortune, interludes, injury conditions and the Churn. Not “classless” as in “something Amos might say or do,” but as in bereft of the character classes used in previous AGE games like Fantasy AGE and Blue Rose. In both Modern AGE and The Expanse, characters pick a background, profession and drive: Where they’re from, what they did, and why they get involved with the story. Where the games differ is that while Modern AGE presents a spread of options suited to a wide variety of contemporary settings, The Expanse’s counterparts come straight from the setting of the books, and incorporate the unusual environments of Earth, Mars and the Belt, leading to characters deeply embedded in its future history. While Modern AGE’s core systems were the basis for The Expanse’s design, we see the Adventure Game Engine as something which should be deeply customized for each setting. 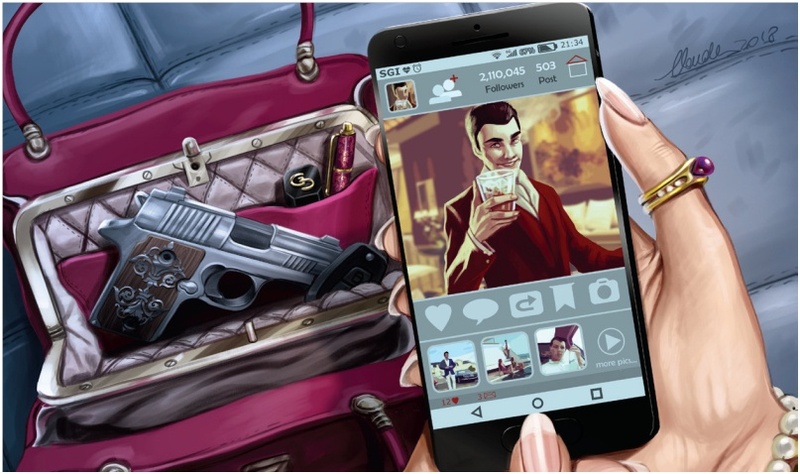 In Modern AGE, which has no core setting, this is accomplished through game modes (Gritty, Pulpy and Cinematic—see here for more on genres and modes) and other options. The Expanse novels present a defined reality for characters to operate in, however, so its rules have been tuned accordingly. Therefore, injuries are tracked using conditions in The Expanse, instead of Health, as they are in Modern AGE, with Fortune acting to moderate them according to a character’s dramatic arc. Similarly, the narrative tone of The Expanse includes the optional Churn system, where luck is always answered by new challenges, because this is how the books play out. Modern AGE doesn’t have that system, though the upcoming Modern AGE Companion will include Dramatic Rhythm, which Game Masters can apply for similar effects. I’m the developer of Modern AGE. Steve Kenson is The Expanse’s developer. We’re treating these as two independent lines for the sake of support and supplements, so that expansions such as the Abzu’s Bounty campaign don’t use a release “slot” (assuming there even is such a thing) earmarked for Modern AGE. Plans for supplements for The Expanse beyond Abzu’s Bounty and The Expanse Game Master’s Kit have yet to be announced. 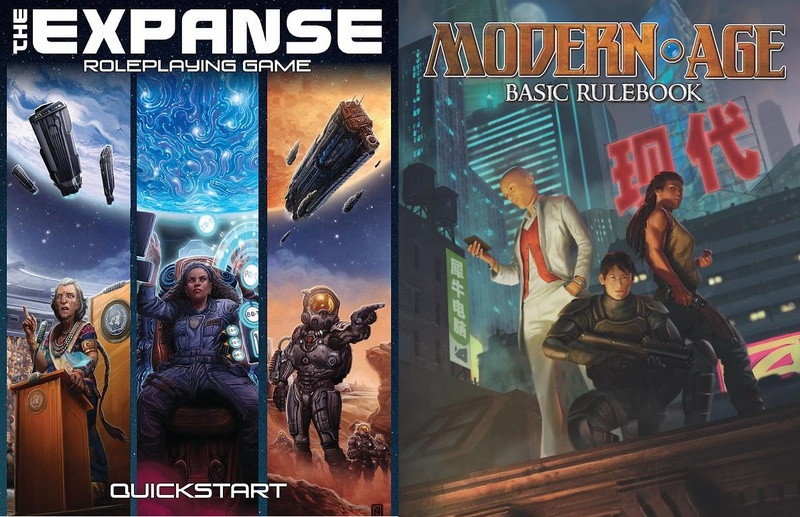 Modern AGE’s core book is shipping now, with the Modern AGE Game Master’s Kit to follow (we had an early shipment come in for Gen Con, so those of you who bought a copy then got the jump on everyone else!). Next up for Modern AGE is The World of Lazarus (based on Greg Rucka’s comic of near future, posthuman feudalism, unrelated to The Expanse) and in early 2019, the Modern AGE Companion. Since the Modern AGE developer is writing this column, he/I get to use the last bit to blatantly hawk that game. It’s for sale! It’s shipping! Get it from us or favorite supplier. However, in fever-wracked visions (seriously, Gen Con made me unwell) I can see Steve frowning, so I will also mention The Expanse Roleplaying Game is in mid-Kickstarter. Back it so we can kick over final stretch goals, including new fiction by James S. A. Corey! 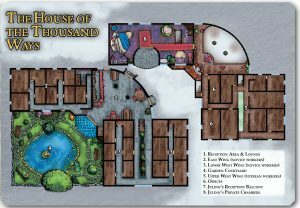 Ronin Roundtable: Nisaba Press update! So, by now, I’m sure you’ve all seen the announcement about Nisaba Press’s first novel, Shadowtide, by Blue Rose’s own, beloved Joe Carriker. Joe turned the final manuscript over to me a couple of months ago, and I worked on the edits while I was in New Orleans for a convention. Readers, this book is lovely. It’s full of intrigue, adventure, and chosen family, led by a smart-talking rhy-crow and a grieving Night Woman. The book is now in production’s hands, along with the interior art order. It’s going to be pretty amazing, and I couldn’t be happier with the first entry in Nisaba’s novel line. But now that Joe’s novel is into production, let’s talk about what we can look forward to next. Nisaba’s fiction is currently focused on our three internal settings, Blue Rose, Freeport, and Mutants & Masterminds. 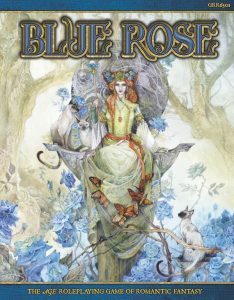 With a Blue Rose novel out, what could possibly be next? How about a Mutants & Masterminds novel, penned by Aaron Rosenberg? Aaron is an experienced novelist who is familiar with tie-in and game fiction, having written for properties including Star Trek, World of Warcraft, Stargate: Atlantis, Star Wars, Warhammer, and Eureka. He’s written for a number of game properties, too, including several supplements for Green Ronin. His combination of game and novel experience made him a great fit for our next Nisaba novel. Coming in fourth quarter 2018 from Nisaba Press, Height of the Storm is a novel about a teenager who gets caught in a storm, and wakes up with a big choice to make. We’ve been through the first round of edits, and the manuscript is back with Aaron for a final writing pass before the copyedit phase starts. Hal has the cover art notes, and we’re looking forward to initial sketches. In the meantime, check out our short fiction, and keep an eye out for an announcement of the upcoming Nisaba Journal, our first collection of short fiction. The Journal will be produced bi-monthly, containing 4-6 short stories in the featured settings, and available in our web store. The August issue includes stories from Richard Lee Byers, Tiffany Trent, Michael Matheson, Dylan Birtolo, Rhiannon Louve, and a prequel to Height of the Storm from Aaron Rosenberg! Thanks for reading, folks. I’m super excited to bring you the next round of fiction set in Green Ronin’s worlds. https://greenronin.com/wp-content/uploads/2018/07/GRR7001_Shadowtide_Flat-72DPI.jpg 648 431 Jaym Gates //greenronin.com/wp-content/uploads/2017/07/RoninBanner-1.png Jaym Gates2018-07-30 08:15:462018-07-30 11:17:10Ronin Roundtable: Nisaba Press update! The past few months have been some pretty hard work finishing up the upcoming Blue Rose sourcebook Aldis: City of the Blue Rose. 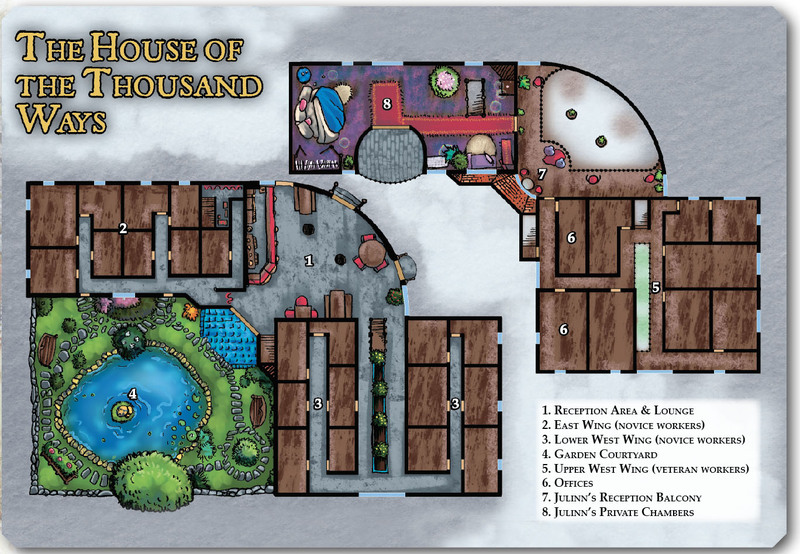 As a developer and a cartography nerd, I love a good city-focused setting book, so being able to help detail the wondrous and near-idyllic capital city at the heart of the Blue Rose setting was a dream come true. 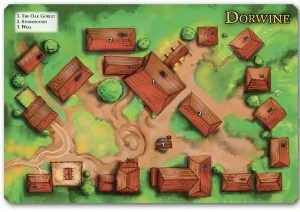 It’s been a great deal of fun guiding writers through creating places, and then seeing those places turned into beautiful, full color maps that inspire as much as they inform. The amazing Liz Courts has lent her talent and vision to this effort, and the results are – as I hope you’ll agree – simply stunning. To demonstrate the scope and variety of maps, I’m taking this opportunity to show off the Palace Complex, heart of the Aldin government and home to the Sovereign, Queen Jaellin; the House of the Thousand Ways, a very upscale pillow house where Aldinfolk can find healing and companionship in the arms of the specialists of the House; and the village of Dorwine, a small settlement in the countryside that surrounds the city of Aldis. 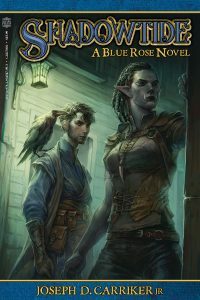 Aldis: City of the Blue Rose will be available for pre-order later this month! Modern Monday: Modern AGE is Out! What’s It About? Yes, Modern AGE is available for print pre-order! This means you can also order the PDF immediately, either on its own, or with your book as part of Green Ronin Pre-Order Plus program. Tell your friends! Post on websites! Don’t believe every placeholder date you see posted in Amazon and vendor sites! Even as we speak, the game is in the queue to go to press. It’s been a trip, from turning the slate of ideas (modern and classless, with some character creation structure provided by Chris Pramas) into a testable, then finished game. I didn’t want to just add guns and technology to Fantasy AGE. To produce an implementation of the Adventure Game Engine that fits the period, we developed some basic design principles. I’ve talked about these before, but since the game is out, I don’t mind going over them again. After that, I’ll talk about where we go from here. Modern AGE structures play around three areas. The Action area includes combat, chases and physical danger. Exploration covers literal exploration along with investigations and breaking into guarded locations. Social interactions are essential to modern games, which usually take place in highly organized societies where politics are stronger than physical force. Consequently, we developed new systems and stunts to support the three areas. Chase rules expand what’s possible in an action scene and can apply to chases on foot or horseback as well as in vehicles. Breaching and investigations support capers and procedural stories. For social interaction, we made relationships and memberships, first introduced in early AGE games, core parts of Modern AGE. Indra and Jeff perform a classic adventure task with new tools. That’s one way of looking at Modern AGE. Modern AGE goes all-in with stunts. Stunts are a distinctive feature of AGE. They perform tasks other games often handle with dedicated subsystems. Grappling and other special combat maneuvers are dealt with here. Instead of using Health points, vehicles get damaged through a special slate of stunts. The emphasis on stunts requires a change in how players should approach them. Stunts are organized into focused lists, and we’ve expanded how many are available. While any character can use any appropriate stunt, we recommend picking your favorites, including stunts modified and improved by talents and specializations. The three game modes—Gritty, Pulpy and Cinematic—let you modify rules to fit the genre which best suits your campaign. I’ve talked about this in prior Modern Mondays, including last week. Mode most notably affects how characters resist damage with Health and Toughness, but also influences stunts, chases and even Resources. 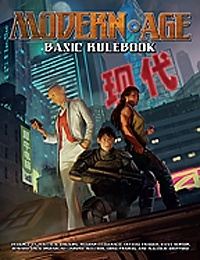 The Modern AGE Basic Rulebook includes everything you need to play the game, including an introductory adventure designed with fantasy and science fiction options, should you wish those to be part of any subsequent campaign. In addition, Freebooter Game Masters at Origins and Gen Con will both be running “Warflower,” an adventure with similar variation. Want a taste of Modern AGE before you get the core book? The Modern AGE Quickstart features a cut down Cinematic mode rules set, pregenerated characters, and a modern fantasy adventure. We’ve announced three upcoming releases. World of Lazarus adapts Greg Rucka’s dystopian feudal future comic for Modern AGE. It’s currently going through finishing touches in layout. The Modern AGE Game Master’s Kit includes a GM’s screen and reference cards. It’s at press. Further along the line, we have several other books at various stages of completion. The one we’ve announced is the Modern AGE Companion, which has just finished editing. This book presents many, many new systems you can use to adjust the game for the genre or feel you prefer. With the core book out, it’s time for me to give Modern Mondays a rest for a little while. I’ll be back from time to time, to talk about upcoming releases and other projects. I’ve talked your ear off about Modern AGE, but I’ve got another game coming: Ork! The Roleplaying Game, Second Edition. See you around! https://greenronin.com/wp-content/uploads/2018/06/new-tools.jpg 611 386 Malcolm Sheppard //greenronin.com/wp-content/uploads/2017/07/RoninBanner-1.png Malcolm Sheppard2018-06-11 08:42:312018-06-11 08:42:31Modern Monday: Modern AGE is Out! What’s It About?